Several weeks ago I was contacted by one Mitch Wagner, the social networking reporter for Information Week. For those of you who aren’t familiar with Information Week, it's one of the most prestigious and well-known Information Technology periodicals. Initially a magazine commencing in 1979, it now has an extensive web presence, live events and even research services. We discussed the question at length in the Particle Lounge over some virtual drinks. The discussion took perhaps an hour, and of course only a few of my quotes made it into Mitch’s excellent article. 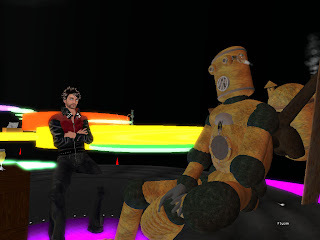 So how is Second Life? It seems we often hear bad news or complaints about our virtual world. In fact, when I told Philip Rosedale I was one of the bloggers, he said “oh oh!” There seems to be a lot of negativity, and that’s known even at the very top. What do I think? I am optimistic. Very optimistic, in fact. Yes, there are problems, issues, confusion, drama, controversy and lots and lots of bugs. But we’re still here, in spite of all that. The concurrent user maximum is beginning to grow again, sales are starting to turn in a positive direction and we see significant efforts aimed at fixing the overly confusing user interface. There are even some companies creeping back into virtual reality, taking the reigns from earlier failed expeditions. Big developments in open source grids promise to blow open the whole space in coming months and years. But most of all, I see endless numbers of enthusiastic creators and others building and using a wonderful world. They are the future. And they are us. Thanks for doing the interview, glad you liked the article - and great pic!